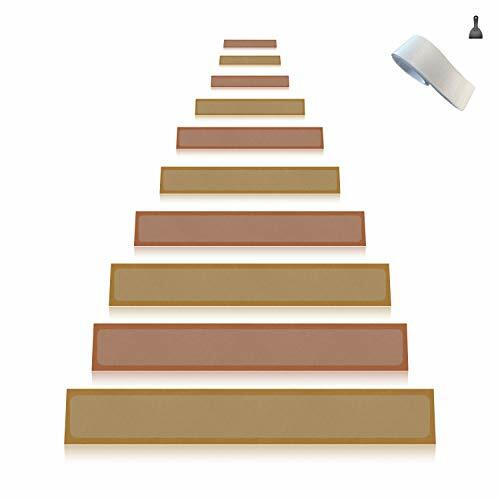 PROTECT THE FAMILY FROM SLIPPING - Easily install the PEVA slip-proof tape on the step or walk area to provide additional safety for kids, adults, seniors, or even pets, in order to avoid dangerous and painful falls on stairs or slick area with Any Beauty safety tape! PRE-CUT & SECURE INSTALLATION- Each perfectlycutting piece measures 4" x 24" to make it easily install on hardwood, granite,marble and other smooth materials with no bubbles or gaps. Simply peel offthe backing and the super adhesive will keep them firmly in place. We provide 1FREE tool for a quick and easy installation. TRANSPARENT & NATURAL - The Any Beauty clear non slip tape is completely transparent. It does not destroy the beauty of hardwood floors, tile stairs and other surfaces. WEATHER AND WATER RESISTANT- Strong and durable adhesive makes it suitable for indoor and outdoor use, as well as showers, entryways and ladders, boats, marine trailers, deck ladders and etc. If you have any questions about this product by Any Beauty, contact us by completing and submitting the form below. If you are looking for a specif part number, please include it with your message.